it has been awhile! but i am back on the crafting bus 🙂 last night i went to an awesome class for Mini Christmas Stockings.. SO CUTE! 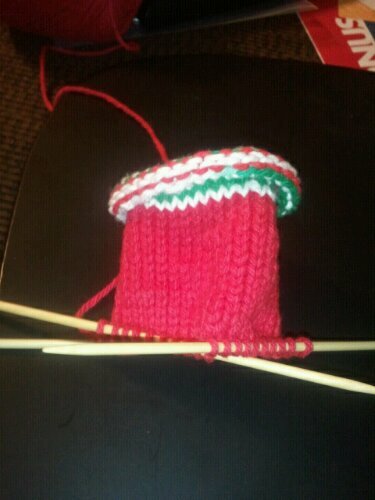 here is the top cuff and the leg of the sock so far. another 6 or so rows and it will be time for the heel. once i get that far, i go back to knit night for more direction 🙂 it is a challenge to work on such small needles, but it is a lot of fun once you get going 🙂 the toe and heel will be the red/white/green and the rest of the foot will be the red.